Zombies, Trolls, and Piercings, Oh My! I love 28 Days Later. It’s my favorite zombie movie (George Romero fans everywhere a calling a Judas). Part of the reason that I enjoy it as much as I do is probably because it was such an intense viewing experience for me the first I saw it. I’d just gotten a snug piercing. 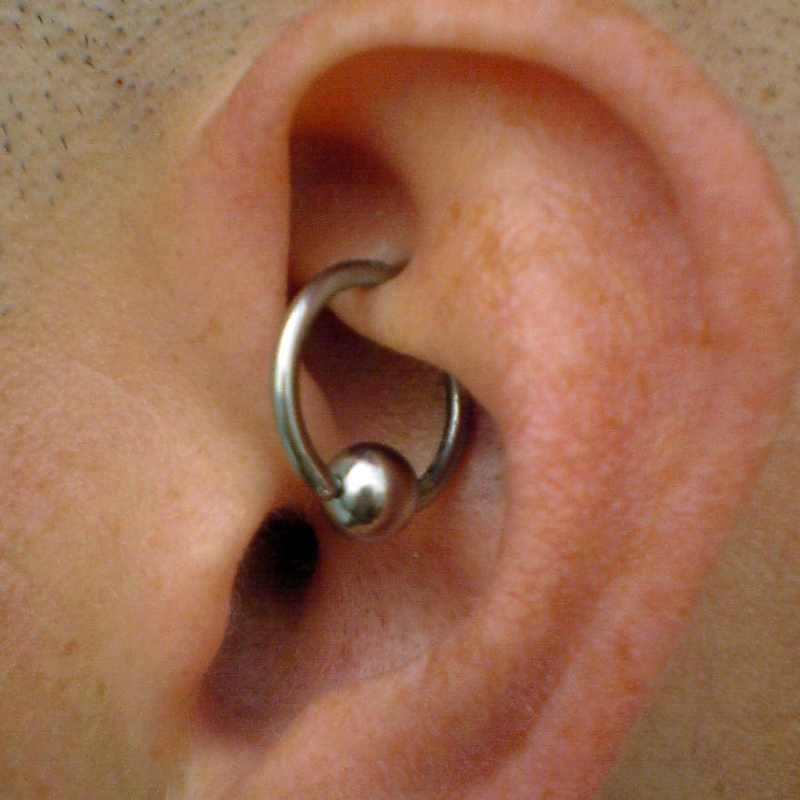 The “snug” piercing is the the thick part. 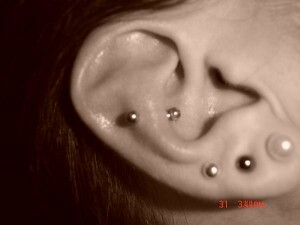 Not the three ones in the lobe. The snug piercing was the most painful thing I’ve ever done, yet stupidly, I went on to get a rook piercing a few months later. (I’d always thought they were both rooks, but in research just now, I discovered they were different things. I was also unable to find a picture of of anyone that had a rook & a snug in the same ear, so apparently, I’m the only one stupid enough to do that). Neither of the piercings fully healed. They frequently got infection and were full of problems. I had them for something like 5 years, and that entire time I could never sleep on my left side (the side the peircings were on). Taking them out was probably the smartest thing I ever did. But anyway. I got the piercing, and I went to the movie. I don’t know if you’ve ever watched a zombie on the big screen while you’re in huge amounts of pain, but it’s very intense. Zombies freak me out. A lot. There’s current trend in literature to humanize that I’m super into. The point of zombies is that they’re a senseless mass. They don’t feel pain. They don’t feel remorse. They can’t be reasoned with.. Their hunger is never satiated. And no matter how many you kill, there’s always a thousand more waiting behind them. That is terrifying. It also makes them the most awesome monster because they’re so unstoppable. You can’t ever really defeat zombies. You can kill some, but there will always be more. You can only hope to hide out somewhere long enough you to catch your breath. Since I’m afraid of zombies, it probably seems weird that I would write about them. But then you consider that I’m super terrified of trolls (like I have to check under my bed to make sure they’re not hiding under my bed like Cat’s Eye or Earnest Scared Stupid to this day). I do not like trolls. They’re gonna live in my walls and steal my stuff and kill my pets and then one day murder me. I’m also frightened of the ocean. Not immensely so, but I assume there are monsters in there that are going to eat. I am afraid of sharks, but that’s not even what I fear so much as like some weird sea creature with ten billion teeth and Angler Fish. You find one thing more terrifying looking than the Angler Fish. You can’t. They are monsters. One of my favorite movies is Labyrinth, but to this day, I’m frightened of the goblins. I’m actually scared of at least 50% of Jim Henson’s creations. I used to have nightmares about Sam Eagle. So given all this, it seems a bit strange that I’d write books about zombies and the ocean and trolls. But since I like Jim Henson and 28 Days Later, maybe I like being frightened. No. I do not like to be frightened. Not all. But I am obsessed with my fears. I’m really incredibly neurotic. So all of my thoughts naturally go to the things I fear most, like zombies, trolls, dying alone, Christian Bale. (I’m also terrified of Christian Bale. People mistake my obsession with him for a crush, but it’s really terror). Every book I write about is just me working through my fears. You guys are all part of my therapy. Thank you everyone. You’ve been very helpful through this time, and I’ve actually been able to stand in my room with the lights off without being certain that a tiny troll with a very strong grip is going to reach out from under the bed and grab my ankle. The moral of the story: 28 Days Later is a very good movie. The zombies are awesome, the cinematography is wonderful, and Cillian Murphy is the greatest.